The tale of the Monier Crockpot. and made great use of it. As both my husband and I were working it was invaluable in that I could prepare the meal and have it put on before I went to work and it would be ready when I got home. The reason I mention the crockpot is that we had it for about thirty years before I passed it on to my elder daughter as we found that we didn’t use it as much, now that we were both retired. The crock pot has a glass lid or should I say “had” a glass lid, up until last weekend when I dropped it and it broke into a thousand bits. The lid had survived all those years, and a family of three children who did the washing up, we had no dishwasher. I am blaming my arthritic thumb for the fact that I dropped the lid. I am now going to see if I can get a replacement lid. I have been looking at forums on the net and they all seem to agree that the original orange crockpot is much better than newer models. I do hope I can find a lid. This entry was posted in Australia, Cooking, Gippsland and tagged cooking, crock pot, glass lid, slow cooking by suth2. Bookmark the permalink. I am not able to get an exact replacement but like you I was able to find another lid that should fit the crockpot. The icing sugar reminded me of when Lewis got into Kirsten’s pantry when he was a toddler and played with the flour! I have been trying to think of an appropriate Scottish word for our dropsy, something that Dad would have said but the word escapes me. Anyway I probably wouldn’t be able to spell it if I thought of it. The same thing just happened to me 😦 Mine was a wedding present 34 years ago and I have just started to use it again. Where did you find your replacement? I just bought a glass lid at a homeware shop. I made sure I had internal and external measurements and also asked if I could return it if it didn’t fit. It was a great fit so there was no problem. You might find a replacement lid at electrical shops that sell household appliances. The other place to look is thrift stores. I hope you find one. Could you please tell me what shop and where? Home and Gift, Bairnsdale, Victoria. I bought mine in the early seventies and still use it regularly….the newer ones just don’t compare with the original Monier Crockpot…. It makes me happy to see my daughter using the Crockpot regularly. They don’t make thinks like the used to. The Kenwood Chef is another example of how the old model is far superior to anything you get today. The blender attachment and the mincer and juicer are all still going strong on mine. I have my mother in laws crockpot. She hardly used it, whereas, I have it cranking all the time. Makes the best casseroles, soup and cooks quinces perfectly.I noticed the lid looks like it belongs to a casserole dish. I thought that’s what it was, I thought mum in law replaced the original. This crockpot is white with flowers on it, with removable brown insert. I love it!!!! I have the cookbook in old “currency”. So good to hear stories about the crockpot. It gladdens my heart to see my daughter putting the crockpot to constant use. Like you she uses it for soups and casseroles as she is a very busy working mum. The crockpot has proved invaluable for her. My wife and I got our model 3350 Monier Crockpot early in the 70’s and we have not given it to one of our family, because we still use it so much. Furthermore, much to my wife’s chagrin, I used to use it as a glossy oil-paint warmer in the colder months. I just put the paint tin into about 3 inches of water in the Crockpot, turned it on to thin the paint and moved it around the room or up the ladder extension cord attached, to enable the paint to flow off the brush ever so smoothly. Another interesting point is that it was “Made in Japan”. Haven’t times changed? Thank you for your comment Ivor. I would never have thought to use it for warming oil paint. Our newer crockpot still gets a fair bit of use particularly in winter. Our newer version was made in China. How did you go with this? I have a monier 3300 crockpot – looks very similar to your except my bowl is removable. I lost my lid in a move a couple of years back and since then have just been using a sheet of foil tucked under the rim – works perfectly! Hi Emma, sorry for the delay in responding to your comment. I bought the glass lid for a frying pan and it fitted perfectly. Thank you. Hi Suth could you tell me what lid and where did you buy it exactly? Size etc as I broke my glass lid from my 3350 also!! Honestly can’t remember the size but I think it was for a small frying pan. Measure the diameter of the hole of the crockpot and the measurement to before the rim rises thne buy the lid that fits in there. Where I bought it was happy for me to return it if it didn’t fit. Hope you have some success. Suth. I don’t care what others might say, the Monier Crockpot IS the best slow cooker. I do not like my current slow cooker, it bubbles too much, even on slow! My smaller, non-removable base MonNier cooks perfectly. However, it is my larger Monier I bemoan. Not only have I no glass lid, but it has now worn out. I really miss it. Boo hoo! Interesting that your new slow cooker has not lived up to the standard of the Monier Crockpot. We now have a Kenwood slow cooker and like you we find it doesn’t equal the Monier. At least my daughter is getting the use of the Monier Crockpot and I know she uses it often. Sorry for the delay in responding to your comment. I would have to agree with you that the Monier Crockpot definitely is the best. I now have a Kenwood and it is nowhere as good as the Monier. An after thought. 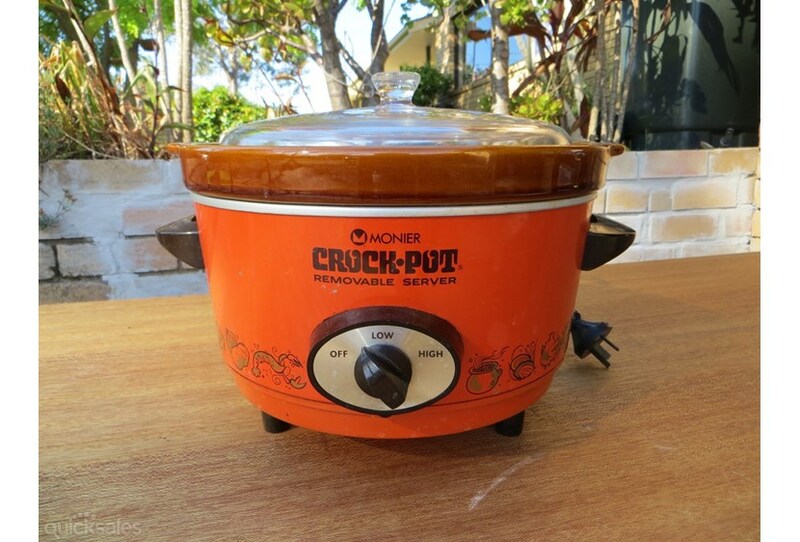 Does anyone know what happened to the company that made the Monier Crockpots? Also, why did they stop making such a valuable appliance? I have a vague memory that there were some people claiming that the crockpots did not have enough heat to cook the food with safety, or something like that. I guess we are the “walking dead”! I have no idea what happened to the company. It would be interesting to find out. Your Crockpot sounds as though it is the same vintage as my elder sister’s. Mine was a little later and had the glass lid rather than the plastic. I got mine in Gunnedah late 60’s. Still well in use but I have always had a hard plastic lid with a small slide opening in it. Gosh, knew I’d had my monier crock pot a long Time. My 3350 gets a good work out at least half the year. Mine has the hard plastic lid with slide vent, unfortunately it has developed a crack. I’ve been unable after all this time to find a replacement. Will look for frypan lid to fit. Love my crock pot. I have had my Monier Crockpot for something like over 40 years. Husband worked for a hardware company & hardware shops had the best kitchen stuff. He bought me the first model, unfortunately it did not come with a lift-out bowl which made it hard to clean, the next model had a lift-out bowl. During winter it is used constantly, a big pot of soup or stew, put left-overs into freezer containers & you have meals for a few days. It came with a plastic lid which cracked & broke. Got a glass saucepan lid of just the right size. I have now got a replacement, no not a Monier. Using it for the first time today, I do hope it is as good as the Monier. Now what to do with my Monier Crockpot? Do I keep it as a stand-by, give it to a Museum, or what? I would keep it as a standby but that is not good as far as the declutterers would say. What brand of slow cooker did you get as your replacement?